Devil’s Island: a reality or a myth? 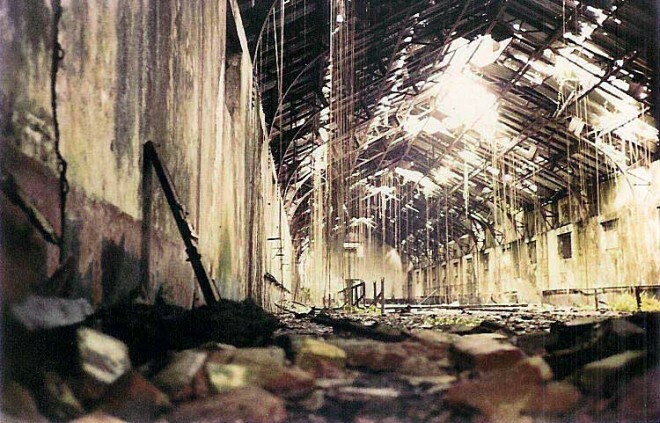 The world became acutely aware of the reality and history of this infamously fabled place when the book Papillon was published in 1970, depicting the isolation and rampant mistreatment of prisoners in this equatorial prison. Devil's Island, or L’Ile du Diable, is located in French Guiana, a "departement" or provincial state of France, in the northern part of South America, just the other side of the Brazilian border. Formerly a French colony, French Guiana as a “departement” today falls wholly under the jurisdiction of the French government. The official language is French, the laws are French, and the schools are French. For all intents and purposes, it is France—with an exotic creole, Amazonian twist. Just off the coast of French Guiana, Devil's Island is actually one of a trio of islands, known collectively as the Iles du Salut. Ile Royale and Ile St. Joseph are the companion islands, but in Anglo-Saxon jargon the name “Devil’s Island” has become synonymous with the whole lot. They lie about 15 milesoff the coast of French Guiana, and just a short day sail from the main city of Cayenne. We lifted anchor from our muddy, Amazonian watershed anchorage in Cayenne for this northwesterly spot, having just spent seven months on the mainland on a “work furlough” of sorts. Michel and I had both found jobs, thus adding some extra padding to our savings, and at the same time Sean began his first foray into formal schooling, attending kindergarten for the first time. Stories and the reputation of the Iles du Salut were infamous and common knowledge in France as being a hell on earth during the heyday of prison operations from 1854 to 1952. Established under France’s colonial dominance, and known more commonly as the “bagne,” or penal colony, banishment to these islands surely meant the kiss of death. It was a hot, mosquito and insect-infested place. Prisoners easily fell prey to illness, disease, and the ravages of the equatorial heat. Bodies were habitually thrown to the sea and sharks became accustomed to the regular food supply, thus insuring their roving presence around the islands. Escape by swimming to the mainland was nearly impossible—although Papillon claimed to have accomplished this feat. We were anchored in the calm, small picturesque harbor of Ile Royale—the main island. From the highest point on this island, there was a commanding view of the anchorage and its neighbors. There was also a small, simple hotel and restaurant. A small dock accommodated a tourist shuttle boat that arrived daily from Kourou, the nearest coastal town, and headquarters for the European Space Agency, the space center launch facility for the Ariane rocket series at that time. Ruins of the prison hospital and vestiges of many the former prison administration facilities dotted Ile Royale. Devil’s Island itself was difficult to access since there was no safe and viable way to travel the short distance from the main anchorage at Ile Royale. There wasn’t a protected spot to anchor a boat, and there was no beach or dock where we could land with the dinghy. The rapid current between the islands was too dangerous to navigate with just a small dinghy. Nevertheless, Michel did venture over there by himself, making a tenuous dinghy landing on a rocky outcrop and was able to tie up for a short solo exploration. From our vantage viewpoint while exploring Ile St. Joseph, we could see that he arrived safely. 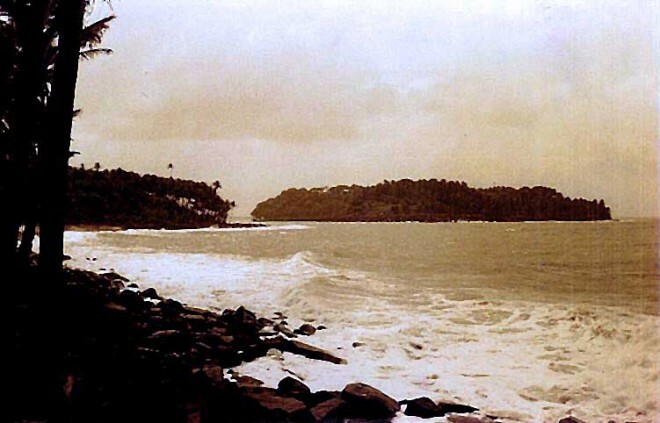 Devil’s Island was completely covered in palm trees, and notorious as the place where political prisoners were held—notably the French military officer Alfred Dreyfus, who was sent there after his unjust conviction for treason in France in 1895. To “accommodate” such prisoners, there were only individual isolated huts on this island as opposed to the many cellblocks that we wandered amongst on Ile St. Joseph. We spent most of our time exploring Ile St. Joseph, where the bulk of the actual prison cells were located. Buried and hidden in the deep tropical jungle foliage, rows and rows of abandoned cellblocks and tiny window-barred, brick cubicles punctuated the island. We literally hacked our way through the dense foliage with a machete in the jungle that was taking over, and seemed to be growing before our eyes. A thick palm and coconut tree canopy shaded us from the heat. 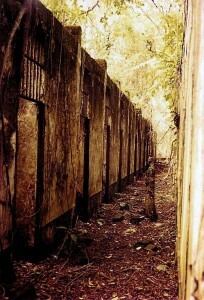 Suddenly, rows of cellblocks just appeared, framed by the foliage. Long crawling vines curled around barred glassless window openings, cushioned by moss, ferns, and thick above-ground tree roots. Countless prisoners’ drawings were everywhere on the walls, depicting their lives, their torture, their despair. Many of the cellblocks had no ceilings, just cell-barred openings from wall to wall, affording no privacy from the guards who paced above. 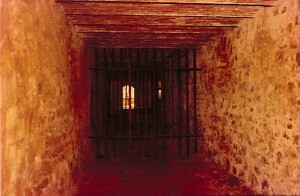 It was a haunting sensation walking in the footsteps of these prisoners. It almost seemed as if they had just left recently in a hurry, as there were still cots, dirty mattresses, and chamber pots strewn about in abundance. We poked around for a long time trying to imagine such a hell in such an island paradise. We were lost in time and our frame of minds. We had no point of references to compare what were seeing and feeling to our experiences up to this point in our lives. Here was a distant past, yet it still seemed so recent in our calendar year of 1985. During their tenure, the prisoners condemned to hard labor tediously built miles and miles of picturesque cobblestone paths and low-lying stone walls throughout the islands. It rendered our walk in paradise these many years later a peaceful, calm experience. Entering one huge airplane hangar-type building, it seemed as if we had entered a living natural history museum exhibit. There were still leg and wrist chains hanging from the walls. Long, Tarzan-like vines dangled down two stories from rooftop holes, poised motionlessly in the air. They were framed in eery soft, veil-like sunlight, punctuated by a prism effect, poking through broken roof tiles that created makeshift skylights. Imagine a hot steamy sunrise in a still-life tableau, viewed through a huge mosquito netlike veil. It was a unique, one-of-a-kind moment that felt like a scene straight out of a lush Disney animated feature. There was a small, protected beach with shallow pools that we returned to several times to spend some afternoons. The boys loved it. We were the only ones and they could play and frolic in complete safety. Scattered about the islands were numerous curious little creatures known as Agoutis (ah-goo-tee). They were quite cute, actually, somewhat of a cross between a squirrel, a rabbit, and a rodent! About the size of a jack rabbit, reddish color, and a face somewhat “squirrelish,” or maybe even part rat, with big hind legs, they randomly wandered about the island, always catching Brendan’s rapt attention. He had just turned 3 years old at the time, and he would stop dead in his tracks, so taken with this little animal as he excitedly waved his little arm and finger, shouting haltingly: “Ah, ah, ah….ahgooTEE”! We spent 10 days wrapped in the time warp of the Iles du Salut. Today more tourist facilities have been established and thus the islands aren’t quite as isolated as when we discovered them. But we have our unique memories and photos, and the assurance that very few people will know them as we did. Cuba Suite: Let Them Eat Lobster!